Flattening tools (often called Hemming or Dutch bending tools) are used to pre-bend the sheet and then press it closed. This technique can be used to finish the sharp edges on the ends of a sheet or to reinforce the sheet and thus strengthen the bent product. A variety of tools in the WILA program can be used to perform this bending operation. Using the New Standard top tools type BIU-051 combined with bottom tool type OZU-083, a flattening combination can be created that can be used for both pre-bending and flattening (see also page 99-101 in the catalog). An advantage is that this tool can also be used for universal bending. Another option that WILA offers is the spring-action flattening tool, consisting of a holder with a spring-action flattening part(type DDU). When combined with a 28⁰ top tool, the sheet can be pre-bent and then hemmed. There are models with V-openings of 6, 10, and 12 mm to suit various material sheet thickness. 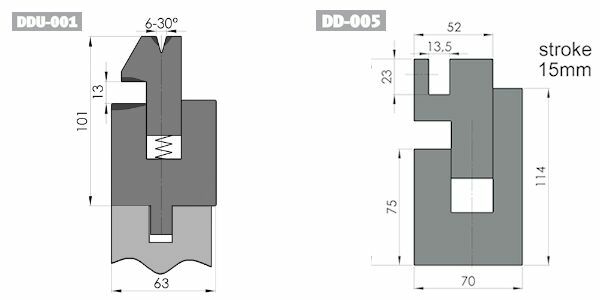 See also page 102 in the catalog for the different types of spring-action flattening tools, type DDU. A third option that WILA offers is a modern version of the spring-action bending tool: The hydraulic Dutch bending tool (type DD). The pressing part is powered by hydraulic cylinders incorporated in the tool. When the tool is inactive, it is in a closed position, and simultaneously serves as a tool holder. Different bottom tools can be placed in the top of the flattening part, making it possible to adjust the size of the V-opening as desired. You can also find the different hydraulic Dutch bending tools (DD) on page 98 in the catalog. Would you like more information about the different flattening tools that WILA offers? Please contact us by phone or e-mail via 443-459-5496 and info@wilausa.com.